ROOF » Zamboanga-Basilan Integrated Development Alliance, Inc.
KATILINGBAN PARA SA KALAMBUAN, Inc. Through the support of the Spanish Cooperation (AECID) and Manos Unidas to ZABIDA, in the implementation of Convenio 2 Project, ROOF as a member-organization, conducted its last set of Logistical Support Turn-Over for year 2017. Last December 26, ROOF turned-over its Logistical Support to Barangay Lamisahan for the Disaster Risk Reduction Manament (DRRM). Present during the turn-overceremony and MOA signing were Hon. Rodel Alvarez and the rest of the Barangay Councils. 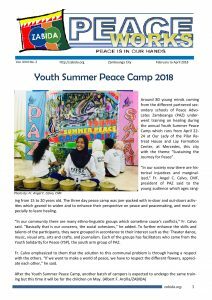 And Dr. Grace J. Rebollos ROOF President, Mr. Khamar Ismael Amsain, ROOF Program Coordinator and LGU -Coordinator assigned in Barangay Lamisahan Ms. Rahsa Alberto. 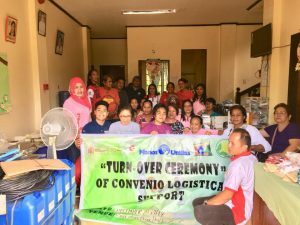 On the same day, Barangay Dulian received its Logistical Support on Gender and Development and sectoral/Poverty Alleviation to the Multi-sectoral Group in the said Barangay. Present during the turn over and MOA signing Hon. Leon Tabuena, Barangay Chairman and the rest of the Barangay Council and the sectoral groups and Dr.Grace Rebollos ROOF President, Khamar Ismael Amsain ROOF Program Coordinator and Ms. Rahsa Alberto LGU Coordinator. Then, on December 23, turned-over 52 sacks of Rice for Rice Retailing as Logistical Support to Barangay Divisoria for the Gender and Development & Sectoral/Poverty Alleviation to the Women’s Association of the Barangay Pamucutan. Present during the Turn-Over, the MOA signing and Induction of Officers were Hon. Marissa Saavedra and Hon. Carlos Guerrero and the Sectoral Groups of Barangay Divisoria. Also present were Dr. Grace Rebollos, ROOF President, Khamar Ismael Amsain, ROOF Program Coordinator, Mr. Dennis Albert, LGU Coordinator assigned to Barangay Divisoria and Asthon Suico, LGU Coordinator. Barangay Pamucutan received Logistical Support for Gender and Development Sectoral/Poverty Alleviation and Disaster Risk Reduction Management on December 28. 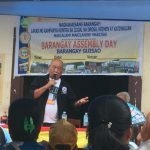 Present during the Turn-Over ceremony were the Barangay Council of Barangay Pamucutan, the Women Association of Pamucutan and the Youth Sector, Dr. Rufina Cruz, ROOF Vice President, Khamar Ismael Amsain, ROOF Program Coordinator, Dennis Alberto and Asthon Suico, LGU Coordinators. 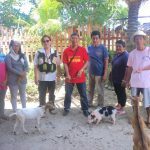 Barangay Bolong proposed an Animal Disperal Project which was supported by ROOF through a Goat and Pig (Swine). A turn-over of the said animals took place at the Barangay Bolong, Barangay Hall last September 2. Present in the ceremony were Hon. Junie Enriques, Barangay Kagawad of Brgy. Bolong, Mr. Erikson Clavano, President of the Multi-Sector group together with other members of the Barangay’s Sector groups. On September 6, 2 units of Canopy Tents were turned-over to Barangay Divisoria as part of their Disaster Risk Reduction Management project. Hon. Jesus Macrohon and the rest of the Barangay Council members participated in the ceremony, Divisoria Elementary School was also represented by Mrs. Malou Rebollos, Elementary School Principal together with the Children’s and Farmers Sector members. 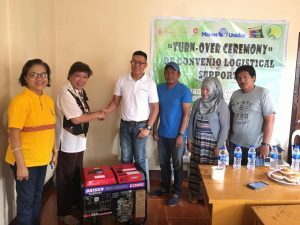 Barangay Recodo, on the other hand, received 1 Unit of Generator Set 7HP on September 7, for their Disaster Risk Reduction Management. The ceremony was mainly participated by Barangay Chairman Hon. Wahab Ibba, Indigenous People Mandatory Representative, Hon. Layna Abdurasid, members of the Barangay Council, Members of the Sector groups and Dr. Rufina Cruz, ROOF Vice President. 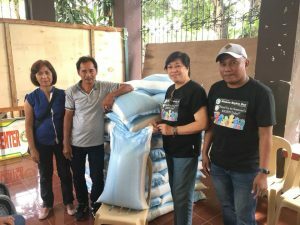 While Barangay Lapakan, on September 13, received 50 sacks of Rice in support of their Rice Retailing Business for their multi-sector groups composed of Women, Farmers, Children, Youth. This is under the Gender and Development and Sector-Poverty Reduction Logistical Support. Hon. 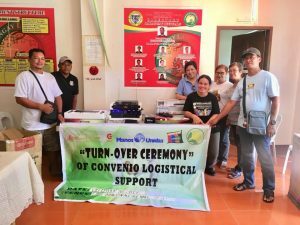 Clodualdo Cosme, Members of the Barangay Council and Mrs. Merlie Cosme, President of the multi-sector group showed their support in the turn-over ceremony. September 26, Barangay Bungiao received their proposed signage on Disaster Risk Reduction Management to raise awareness to its community. This is to strengthen their Disaster Risk Reduction Management in the Barangay. 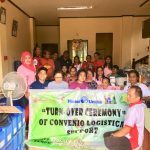 Present in the turn-over ceremony were members of the Barangay Local Government Unit, Sector group members of the Barangay which is headed by Kagwad Leo Resurreccion, Kagawad Flordelina Sadallani, Kagawad Babyna Gregorio, Mr, Olie Paulino, Bellas Mujeres de Bungiao President, Mrs. Luz Ramos. ROOF capped off their series of Logistical Support turn-over in Barangay Cabaluay. 4 units of Sewing Machines for their livelihood Project to the Women’s sector which is dressmaking, 2 units of spine board, 4 units of neck brace and 2 units of harness were also turn-over for their Disaster Risk Reduction Management Logistical Support proposal. 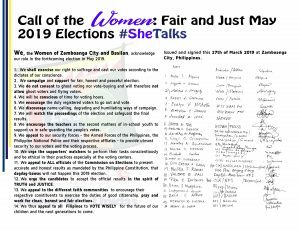 Barangay Captain Makko Apolinario and members of the Barangay Council of cabaluay and the President of La Mujeres de cabaluay, Mrs. veronica Francisco showed their support through their participation. With its continuous efforts in collaborative and participative governance, ROOF conducted an Impact Assessment on Barangay Performance following the DILG Impact Assessment tool last March 21 to March 22 of this year at LM Hotel, Tetuan, Zamboanga City.